Farpoint Astro has continued to rollout products as a result of its parent company, Optical Structures, acquisition of the JMI and Lumicon brands. Two of the most popular products offered from these brands are now available: JMI Medium Wheeley Bars and the Lumicon UHC Filters. Optical Structures Incorporated (OSI) owns and manufactures the Astrodon, Farpoint, JMI, and Lumicon brands. Among the most popular of JMI’s extensive product lines was its Wheeley Bars, the easiest way we know of to move mounted telescopes to and from observing locations, even if the trip is as short as from your garage to the end of your driveway. The Medium Universal Wheeley Bars are adjustable to fit a wide range of tripod-mounted telescopes. 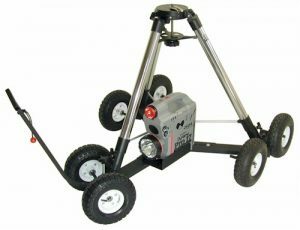 The base configuration ($319US) includes 2.375-inch (6.0 centimeter) swivel-caster wheels, but larger 5- or 10-inch (12.7- or 25.4-centimeter) wheels are available at additional cost. The assembly consists of a sturdy base with locking wheels and leveling bolts. Easily move, lock and level the complete telescope assembly from location to location without the need to disconnect and reconnect all the electrical and computer cabling during transport. More good news: The long-a waited Lumicon UHC filters are also now available. The preliminary transmission scans were so good, Farpoint reports that it considered labeling them the Lumicon UHC Platinum Edition (same price). The 2-inch UHC is priced at $200US, the 1-inch at $100US, and the SCT version is $200US. Many observers consider the Lumicon UHC Filter unbeatable for revealing nebulosity. This is achieved by passing three nebula emission lines – the two doubly ionized oxygen lines (496 and 501 nm) and the H-beta line (486 nm) – while blocking light-pollution and sky glow. The result is superb views of the Orion, Lagoon, Swan and other extended nebulae. Strictest quality control standards are employed throughout the production process. Each Ultra High Contrast Filter is individually inspected and scanned with the percentage of light transmittance of the OIII and H-beta emission lines.